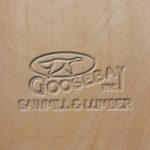 Basswood - Goosebay Sawmill and Lumber, Inc. The basswood, or linden, tree has a wide distribution in the eastern half of North America from the Canadian provinces south through the United States. The heartwood is a pale yellowish-brown with darker streaks. The sapwood is wide and appears as a creamy white or pale brown that merges into the heartwood. Basswood is soft and light with a fine, even texture and a straight grain. This makes it an especially good wood for hand carving. It is easy to work and not prone to tear out. Other than for carving, basswood is used in venetian blinds, sashes and door frames, mouldings, and in apiary supplies. It has a relative hardness of 410.